The new telecablesat.fr website is online. 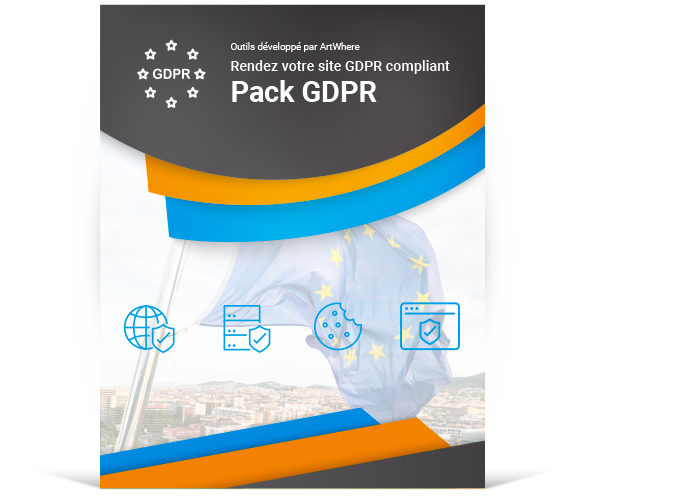 Discover our GDPR pack: Fast and efficient, be GDPR compliant in the blink of an eye! ArtWhere: Creativity, development and strategy from one partner… Mission Impossible ? With the growing use of mobile devices to surf the Web, a Website cannot function without a responsive design. The content and graphics adapt to any screen size, from small to big. 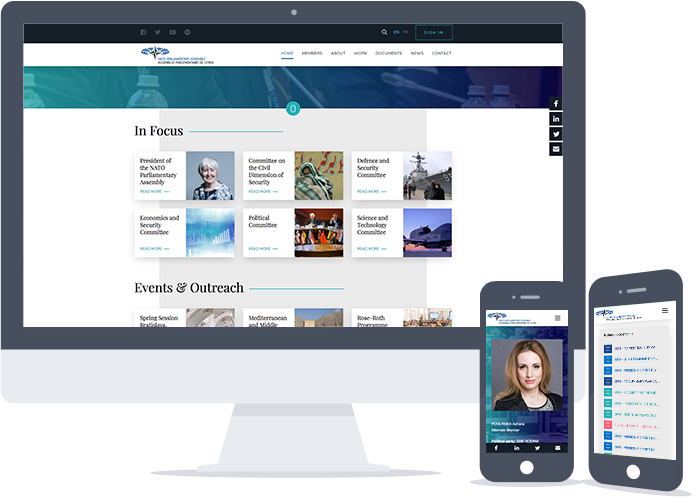 Several solutions are possible: the concept of one unique responsive site or the making of 2 separate sites – Desktop (yoursite.be) and Mobile (m.yoursite.be). These applications help you get the most out of smartphones and tablets features. ArtWhere quickly understood the prominence of Social Media as viral marketing tools. We develop fun, educational or informative Facebook Apps promoting your image, products and services. These applications enable over a billion users to talk about you through their friends’ networks. 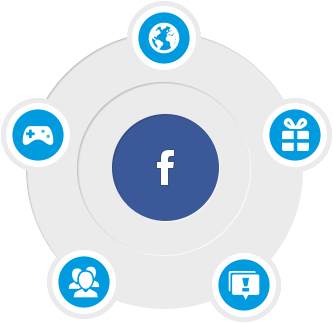 We develop a Facebook App according to your communication and marketing needs. Then comes the implementation and activation phase. Some screened users will have the task of spreading the application … like an infiltrated spy. Create an attractive and efficient Website, also easy to manage, is a difficult mission. ArtWhere knows it and supports you throughout your Web Design journey. Our team of ergonomics, graphic designers, developers and project leaders act in order to make your Web Design successful and a reference for your target audience. ArtWhere’s goal is to provide his customers with a simple and comprehensive tool to freely update their website by themselves. Once the site is online, changes can easily be made without the intervention of Computer technicians or Web experts thanks to Content Management Systems (Neo-CMS, Drupal, Joomla, WordPress…). GRAPHICS A design at your image! Your website’s or Web application’s visual identity is essential. It should reflect your image and activity. The ease of use, ability to navigate the site, clarity and ergonomics are the goals that we set to ensure users satisfaction. Search engines are the most important visitors on you Website. They will advertise for you the most on the internet. Would you like an e-commerce solution to sell you products to a wider market? The online store offered by the ArtWhere team presents you items in an attractive and original display. CMS (Content Management System) are softwares enabling the creation and management of a website’s contents. According to your needs, ArtWhere offers the most appropriate CMS among the market leaders in order to implement your Web project. The most powerful, professional and comprehensive are Drupal, Neo-CMS and WordPress. These CMS use the latest technologies and possess several features. They will enable you to create a dynamic Website and modify it at any time. You will be able to modify the texts, images and multimedia contents on your website or platform with ease. The newsletter is a widespread loyalty tool. It allows you to establish a close relationship with your recipients and remains your website’s essential complement. The mailing system by ArtWhere manages bulk email exchange to your list of members and allows a message personalization and follow-up. You invite them to visit you website to acquire more information. The Cloud is an online storage service offering the possibility to access your data whatever they are, wherever they are (at a different station, on your Smartphone, your tablet) and, thus share them. For more security and upgradability of your computer resources, we suggest that you share them in our Cloud. telecablesat.fr is getting a makeover with its news related to movies, TV series, etc. but also its selection of the day and its famous section Télécartable to advise every day programs to students regardless of their age. eInfraCentral’s mission is to ensure that, by 2020 a broader and more varied set of users (including industry) discovers and accesses the existing and developing e-infrastructure capacity. A common approach to defining and monitoring e-infrastructures services will increase the uptake of and enhance understanding of where improvements can be made in delivering e-infrastructure services. A brand new site for the NATO Parliamentary Assembly. It allows you to share both public and private documents, but it also contains a directory with information about its members for connected users. 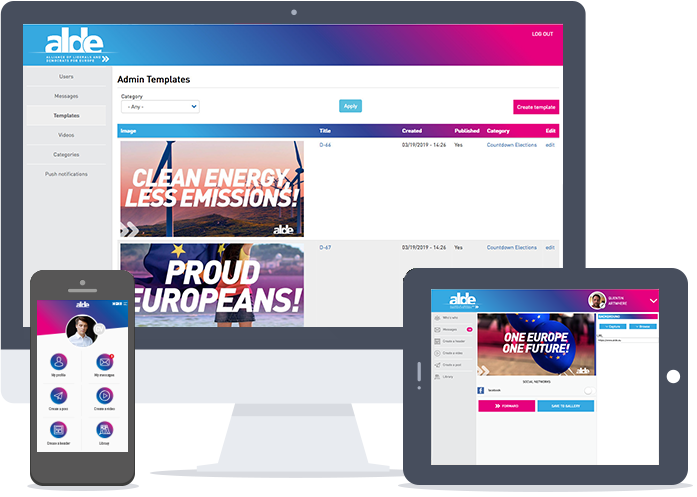 The new application for ALDE is online. This allows users to create and share posts or videos related to news on social networks. 4Clinics is a Contract Research Organization (CRO) providing Data management, Safety, Biostatistics, Scientific Writing, Regulatory Affairs and Clinical Operations services for clinical and epidemiological studies with a particular expertise in vaccines, immunology and cell therapy. With the application of Ronquières Festival you will not miss anything! Consult schedules to see what time your favorite artist is on stage. Have you a question about access to the festival, tickets or opening hours ? Everything is here! Finally, the site plan will allow you to find your way easily. The beautiful Enghien Park hosted the 9th edition of the festival LaSemo. The greenery and history saw settle two scenes but also a multitude of activities. We developed the mobile application to know the news of the festival and manage cashless. Realization of an application for the technical inspection for CMI. The application is developed for the Active Galaxy Tab tablet and is used by inspectors to automatically prepare their reports at the end of visit. The entire application is customizable by management from an administration interface. All4it interventions are part of a project or outsourcing. Each intervention is the subject of a mission statement and can be conducted by technical teams on all continents. During the past two years, consultants have occurred on all continents. Start-up created in 2014, by passionate and experimented people, EMISYS is the European provider of innovative RFID-solutions to support event and membership management (live events, ex-hibitions, sport clubs and night clubs) and to hugely improve customers experience. In addition to the information website developed by us in Drupal, this is the new e-commerce site on which Moustique sells its paper and digital subscriptions. Adaptive home page based on news and events in the development of content blocks, a home page of the type of a news site with lots of content (news, events, press releases and others), the establishment of call-to-action for donations and participatory side and an operating depth of the search engine to highlight a theme. The new responsive website of the "European Microwave Association" is online. More peaceful, more informative, more environmentally friendly than a serial killer, here SerialTrieur! A game, made available by Fost Plus and Intradel, allowing you to have fun, but also to master all the subtleties of the sort, whether PMC, glass, paper and cardboard, organic waste or residual waste. You choose the right destination for each waste. Several levels of play are waiting for you. A final sorting game! Good fun! Une application basée sur le site mobile m.1307.be avec des fonctions spécifiques : ajouter aux contacts et créer une liste de favoris. The new lalibre.be website is the result of a tight collaboration between IPM and ArtWhere teams. In 2010, the Walloon Agency of Telcommunications (“AWT”) graded the Braine-l’Alleud website among the top 5 in its report about towns’ websites. Laurence Bibot’s new website has gained popularity. A site in all simplicity for a comedian with off-the-wall humor. The success of a Web project depends a lot on the quality of conception and the experience of its designers. For over 10 years, ArtWhere has been building experience while creating Web projects for a wide range of customers. A strong dose of passion and ingenuity can add up to the expertise and reflects in each engaged mission. But on top of all, at ArtWhere’s we like to take challenges. We innovate and research new products and concepts in order to constantly better existing Web solutions. Help the world of the Web evolve in order to offer customers and users with a unique experience: that’s our goal! Creation of ArtWhere in the years 2000. First one of a long list of Internet sites conceptions for our partners. “Trophée Racine” award, rewarding the young most promising company in Wallonia. Creation of Ottignies-Louvain-la-Neuve website with the development of an online municipal documents ordering system. Elected best Walloon towns website by AWT. Online publishing of “Ciné Télé Revue» magazine: number 1 French speaking press in Belgium. For ArtWhere, it’s the beginning of its expertise in online press sites conception. Rise of social networks as inevitable viral marketing tools. It’s also this Web agency’s development of a first application for the social network Facebook. Implementation of the first mobile application for the Internet website EETimes, which is intended for display on iPad. Creation of the first Responsive website, adapted to desktop screens, tablets and Smartphones. Fundation framework and integrated via Drupal C.M.S. Bootstrap and integrated via Drupal C.M.S. with setting of an automatic file management. Launch of the new telecablesat.fr website with news related to movies, TV series, etc. but also its selection of the day and its famous section Télécartable to advise every day programs to students regardless of their age.